Video captured Sunday shows a "megapod" of thousands of "common dolphins" off San Diego's coast, estimated to be of about 2,500 dolphins. 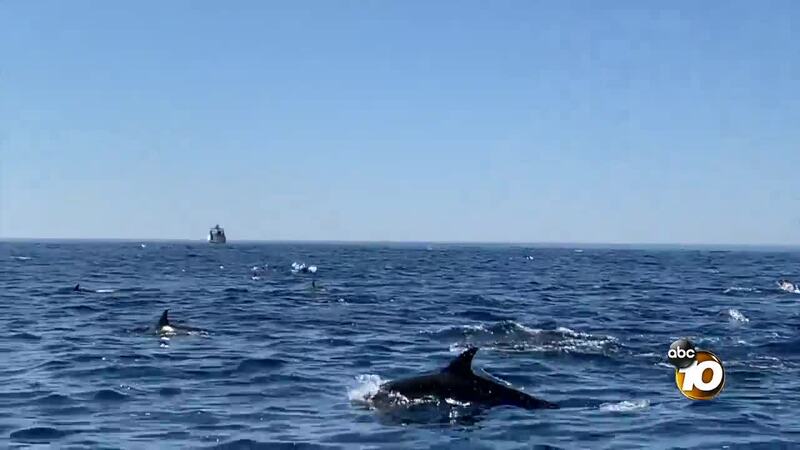 SAN DIEGO (KGTV) — Humpback whales aren't the only aquatic life giving locals a show off the coast of San Diego. Dolphins can be seen fairly regularly, but it's not everyday you see a pod tallying in the thousands. The term "mega" gets thrown around quite a bit to describe scale, but in this case, it truly fits. Domenic Biagini, a photographer for San Diego Whale Watch, said pods of 25 to 200 dolphins are common. But a megapod, or "superpod," refers to pods eclipsing 1,000 dolphins and may be seen once every other month. "Every now and then, we'll see multiple pods come together," Biagini said. "This was like next level." This experience was so surreal ❤️ Went whale watching for the first time and ended the trip surrounded by a mega-pod of 2,500 dolphins! He adds that the influx of bait off San Diego that has attracted humpback whales is likely bringing in more dolphins as well. "It's certainly not a coincidence," he said. The phenomena is likely to drive continuing interest in viewing our aquatic neighbors as springtime settles in, but it's important to do so safely above all. "Dolphins are a little different because they kind of rush up to the boat," Biagini said. Dolphins enjoy playing in the waves a vessel can create. "Make sure you’re going the same speed they’re going and make sure you’re going the same direction they’re going." Biagini adds that its a good idea to read up on the Marine Mammal Protection Act beforehand to make sure your viewing isn't putting whales, dolphins, and other life at risk.